Submitted by HS on Wed, 2012-08-29 07:42. Submitted by HS on Wed, 2012-08-29 07:43. The Studio Display XT2 is a recent addition, with completely redesigned electronics from the ground up, new modifications and features added according to customer requirements. We now have multi-colour for all segments. This means during playback timecode is in green, "ready" is in yellow and during recording, all segments turn red. Optionally, you can choose a base colour of red-only, for all modes. PunchLight DLi included: Another important change is the USB connection via the PunchLight DLi (Display&Light interface), which is included. This small box has one output for the Display XT2 and also two additional outputs for connecting external lights, such as the Recording Display, Lamp, Ring etc. 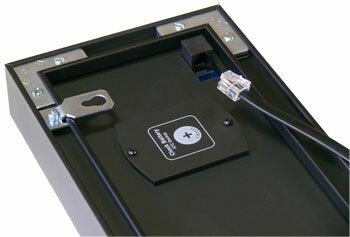 The PunchLight DLi connects to computer via a standard USB 2m cable. The Studio Display XT2 is hooked up to the PunchLight DLi via a six-wire cable, terminated at both ends using RJ12 phone-connectors. 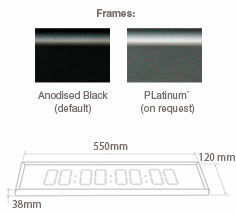 This cable is supplied in the standard length of 10m, with 20m on request. For other lengths please check with us. The Studio Display XT2 has seconds newly added to the clock. 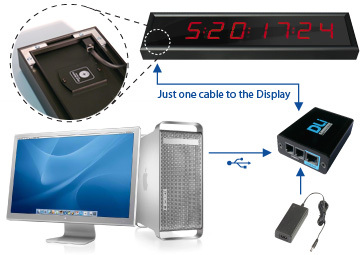 In addition, Time is now continuously backed-up by an internal battery, so the clock is still set when the unit is turned off or disconnected from the power supply. The best functions from the previous version have been kept: it displays timecode, time, or samples & bars. The remote control can turn off the last two segments, switch between dot or colons, filter MTC, switch the display between "Pro Tools" or other audio applications ("Generic"), and set overall brightness. 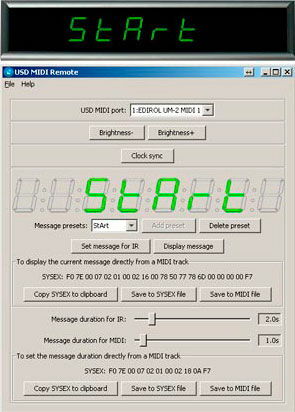 You can still send custom messages from your computer to the display - using the remote. Submitted by HS on Wed, 2012-08-29 07:45. 550 x 120 x 38mm - 21.7" x 4.7" x 1.5"
digit height: 57mm / 2,3"
Submitted by HS on Wed, 2012-08-29 07:46. Submitted by HS on Wed, 2012-08-29 07:47. Submitted by HS on Wed, 2012-08-29 07:49. Submitted by HS on Thu, 2015-06-11 13:58. 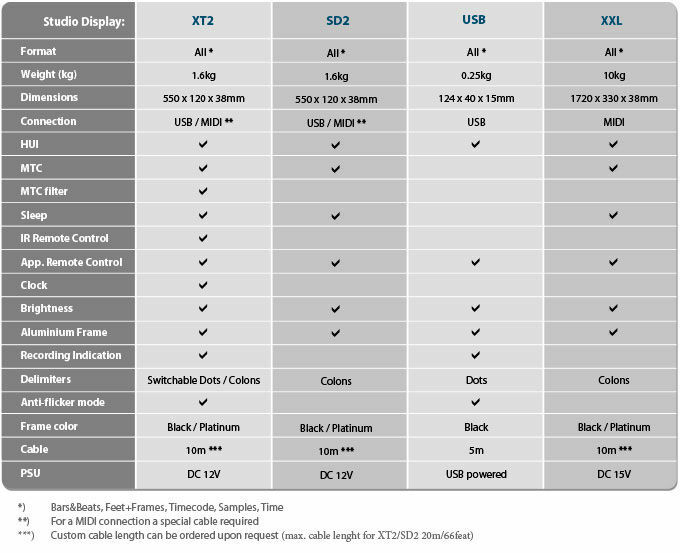 Q: What’s the difference between the Studio Display XT and XT2?